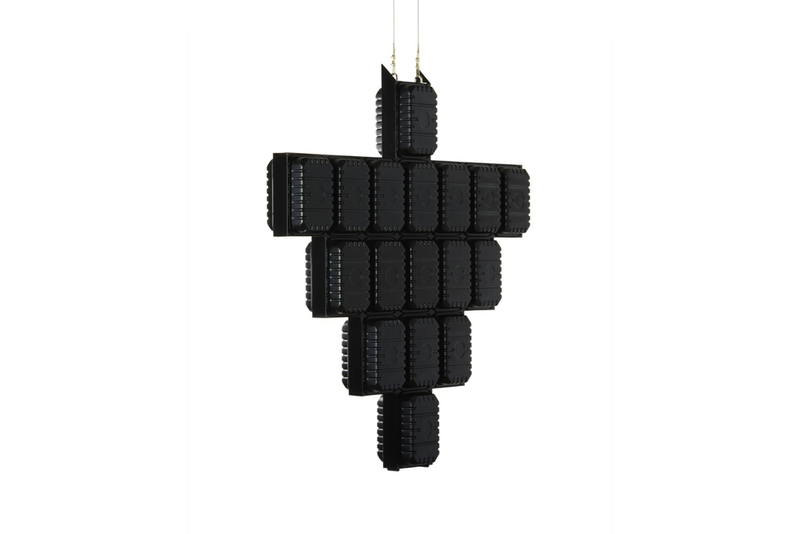 The BBQ Bat House is a fully functional bat house created from black vacuum formed plastic sausage packaging trays. The work was made for a charity auction and exhibition called The Birds, Bats and Bees. Internationally renowned artists and designers were commissioned to create hand-made prototype habitats for the rapidly declining numbers of bird, bat and bee species in UK urban areas. These bird, bee and bat houses were created using Phillips de Pury & companys waste such as cardboard, crates, invitations, catalogues, plastics and other recycled materials. Over 45 prototypes were auctioned on 24.06.08 in London at Phillips de Pury & Company, the proceeds of which went to benefit Adventure Ecology’s Foundation, Sculpt the Future. Participating artists and designers were Tomoko Azumi, Jurgen Bey, Martino Gamper, David Harrison, Stuart Haygarth, Henry Krokatsis, Max Lamb, Peter Marigold, Tom Luis Berrios Negron, Tom Price, Raw Edges, Rolf Sachs, Sir Paul Smith, Michael Sodeau, Marcus Tremento, Gavin Turk and Christopher Williams.